Xing Guardian is quite an impressive new title that just got released by Next Gen Gaming, as it has gone live at many casinos. Thanks to the game’s theme, its winning chances, its features and visuals, it has become quite popular. The game takes players to the Chinese mountains in search for the Xing Guardians for a highly rewarding and an adventurous game. The game hosts multiple bonus features and winning chances for players to take advantage of during the game play. Players who are intrigued by all of this can check out the game here for fun to see what the game has to offer prior to placing any real money bets. 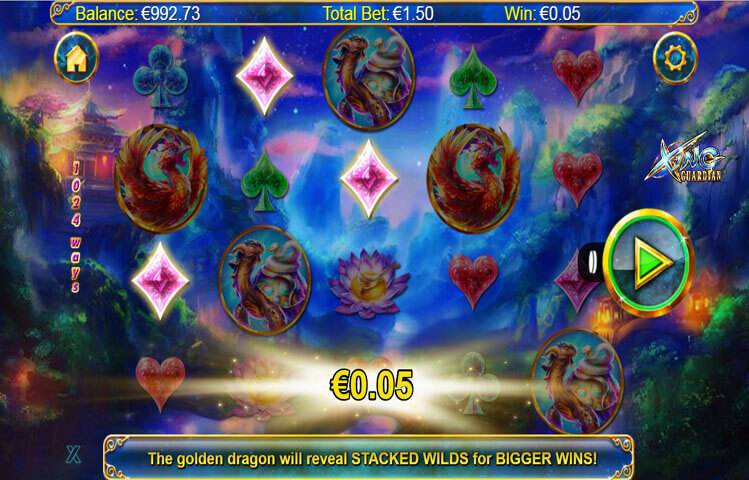 Xing Guardian is a Next Gen Gaming powered video slot machine that offers players an outstanding gaming experience. This is because the game is smooth, easy to play and offers an outstanding engaging adventure. The game takes players to the mountain tops in China where they can look for the ancient Xiang Guardians. That is not all, as players will get to search for the fortunes and treasures of these guardians and claim it as their own. Players will be able to claim these fortunes through the 1024 ways to win of the video slot, as well as the special features and bonuses that it has. Players can find all about these special features and bonuses at the paytable of the game. They can open it by opening the settings button then the “I” button that views the payouts table’s pages. Xing Guardian comes in state of the art visuals that would immerse players into the theme. It helps provide players with an engaging ride. The game is set in the Chinese mountain tops where players will go look for the Ancient Guardians. They will find a mountain, a river and a Chinese mansion in the background. As for the symbols that will appear on the reels of the gym, they include the guardians such as the tiger, the tortoise and the dragon. Other symbols include a golden ring, flowers, poker card suites and more. Xing Guardian is a highly rewarding game, thanks to its special icons and features. The game has a wild which is the Chinese princess. She will replace all other icons, except the scatter to help players create a payout. The scatter icon is the Ying Yang symbol. This scatter would give scattered rewards, plus activating the free games of the game, which gives players 10 free spins. There are also two more bonus rounds that can become active during the base game. They are the Rise of the Dragon and the Xing Guardian Locked Reels.